In their natural habitats, red-eared slider turtles are semi-aquatic, meaning they spend a good deal of their time in the water, but also spend a significant amount of time basking in the sun. While this basking may look like the turtle is just lounging around, it's actually important for the animal's health. When kept as a pet, a red-eared slider needs a tank that is large enough to provide both water for swimming and an area where it can dry off and bask. When cared for properly, red-eared sliders can live a long time and be very entertaining pets. 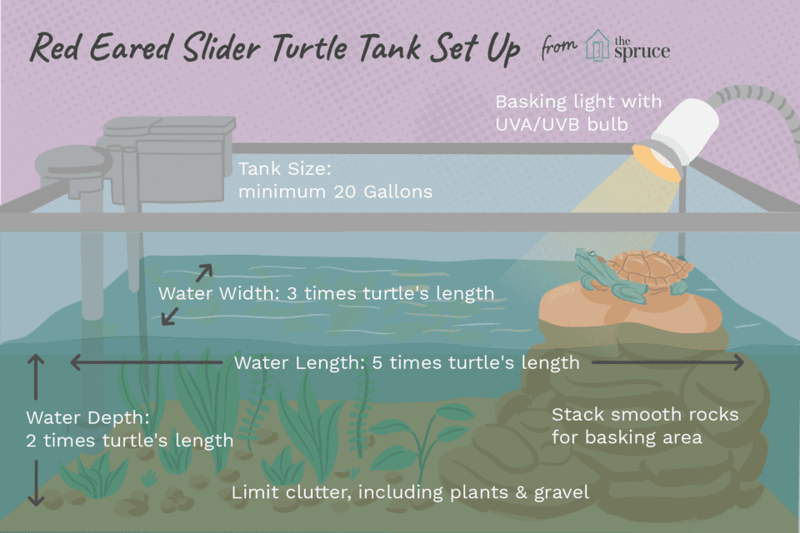 Plan on a tank size of 10 gallons of water per inch of the turtle as a general rule of thumb, with a minimum size of a 20-gallon for hatchling red-eared sliders. Keep in mind that red-eared sliders can read 10 to 12 inches as adults, and it's clear why you eventually will need a very large tank. Large plastic containers or storage tubs are good alternatives to aquariums as long as you don't mind being unable to view the turtles from the side. You won't need a lid as long as the container is tall enough and the basking area is positioned so that the turtles can't climb out. Red-eared sliders need an adequate amount of water in which to swim. At a minimum, the water should about twice as deep as your turtle is long (so a 4-inch turtle should have a minimum water depth of 6 inches). The length of the water area should be at least five times the length of the turtle, and the width should be at least three times the length of the turtle. Red-eared sliders are strong swimmers, so you don't need to worry about drowning as long as the turtle can get out of the water and there is no place it can get trapped underwater. Between feeding and defecating, turtles are pretty messy creatures. Your turtle tank should include a good filtration system such as a power filter or canister filter to keep the water clean. Choose a filter rated for at least double the amount of water you will be filtering since turtles are such messy pets. Filtration will reduce the frequency of water changes but your turtles will still require 25 percent water changes weekly and a thorough cleaning once a month or more. Feeding your turtle in a separate container helps minimize the mess in its tank and reduces the load on the filtration system. The basking area for your turtle can be provided by stacking smooth rocks and sloping large smooth gravel to one side to make a land area. You could also use wood or a plastic "turtle dock." Whatever you choose to construct a basking spot, make sure your turtle can climb onto it easily and that it allows your turtle to completely dry off. When designing a tank, keep it easy to clean (uncluttered) and remember that turtles can knock things over and push stuff around. Plants may be a nice aesthetic touch but turtles are likely to make a snack of them or uproot them. Plastic plants will likely be uprooted and just make cleaning more difficult. Likewise, gravel can make the tank harder to clean and you must make sure it is large enough that it won't be accidentally swallowed. The water in a red-eared slider turtle tank should be kept at about 78 degrees and up to 80 degrees for hatchlings. The ambient air in the tank should be between 75 and 80 degrees, with a basking spot between 90 and 95 degrees. A submersible water heater can be used to keep the water warm if necessary, but a broken heater is a potentially lethal situation if it heats up the water up too much. You can protect the heater so the turtles can't bump it by placing it behind something (a brick is one idea) or by fashioning some sort of cover (a piece of PVC pipe could be used). Get a good aquarium thermometer and monitor the water temperature. Provide a light over the basking area to keep your turtle warm when it gets out of the water. A reptile bulb/heat lamp in a reflective lamp can serve this purpose, but make sure there is no way the turtle can touch the light or that the light can fall into the water. The basking light will help heat the air in the tank as well. In addition to the basking light for heat, provide a full spectrum reptile UVA/UVB light. Exposure to UVA/UVB is necessary for proper calcium metabolism and also appears to have other benefits to overall health such as improving appetite. It is also nice to take your turtle out into the natural sunlight in warmer weather if you can. Get a proper reptile UVA/UVB bulb and follow the manufacturer's guide regarding placement of the bulb. UV rays diminish the farther away you get from the bulb, so it is important to place the bulb where the turtle can benefit best. Replace the bulb as recommended by the manufacturer, since the intensity of UV produced diminishes over time. If your turtle lives outside, this light is not necessary.